What Is the Purpose of Cardboard Containers? Our cardboard containers can be useful in so many different situations. They are beneficial, because they arrive flat and are easy to put together, so large quantities of them can be stored on-site without taking up too much room. They are great for storing items that may damage the container over time, because they can easily be replaced with a new one. Our cardboard box containers are also great for storing and transporting paperwork, because they have lids on top of them and come with convenient carrying handles on the sides. Our k-bins are also great to store things like index cards and other small items that need to be accessed regularly. They have a spot on the front of the box where a label can be placed so people know what's inside of them, and the front of the bin is lowered for easy access. 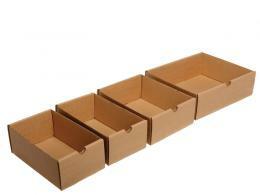 Our cardboard storage trays can also be useful in a situation where someone needs to keep items on a shelf. They have easy pull-out tabs so they can be slid off of a shelf, and they also have a spot on the front of the box for a label to be placed. Where Can Cardboard Containers Be Used? 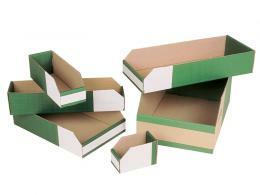 Our cardboard containers are great to use in any sort of workplace where people need to remain organised at all times. The k-bins come in a variety of sizes, and they will also fit on a shelf easily. The same can be said of the cardboard storage trays; they are easy to put together and can fit on a shelf with ease. 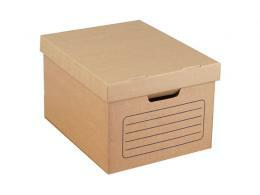 The archive boxes are also great for any lawyers office, police station, or office where paperwork needs to be stored instead of thrown away. Our cardboard containers come with a one-year parts and labour warranty. They will also be delivered to your establishment for free.